Last month, I wrote about my talk on Encouraging Perseverance in Math Class, given at the Fall, 2012 ATMOPAV conference. But earlier that same day, I had the opportunity to hear Scott Steketee‘s thoughts on functions: “Function Dances: Using Transformations to Make Variables Vary and Functions Behave”. I have found that the approach many teachers take to functions is one of notation only. That by simply introducing the f(x) and g(x) symbols, and “covering” domain and range, algebraic functions will be understood. Scott’s presentation provided ideas for introducing the concept of function, without all of the scary symbols, through dynamic Sketchpad files. The group worked through a number of progressively intricate functional relationships on iPads. In this first example, students can grab points and look for relationships. Some points will not move when dragged, as they are “dependent” upon other points’ movements. Also, the dependencies vary, from simple linear relationships, to a few which require dilations or reflections. 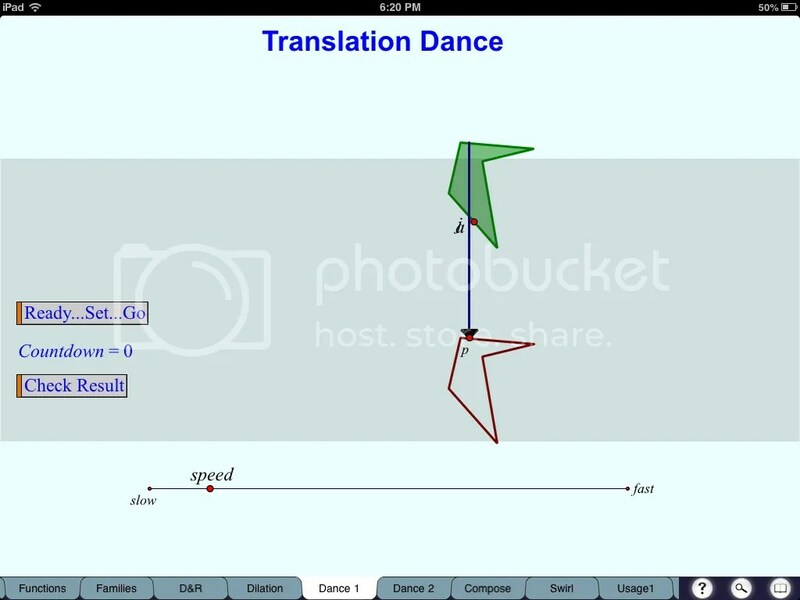 Later, we were introduced to the Sketchpad “Translations Dances”. As one point (below, the point on the green outline) travels about its “domain”, we are challenged to trace the “range” of the translated point p. These start off innocently enough, but become more diabolical as the translations begin to include reflections and rotations. These were addictive and appropriate uses for the iPad, and I was able to easily load the files into iPad’s Sketch Explorer through my DropBox account. The second half of Scott’s talk was more kinesthetic, social, and potentially embarrassing, as the group split into partnerships to choreograph dances based on transformations. My partner acted as the independent variable, and I (the dependent variable) followed her actions, using lines in the floor to act as axis of reflection. This would be a fun way to expose kids to functional ideas, but I made sure that no photographic evidence of my dancing ability exists! What I appreciated most about Scott’s sketches and dances is that they allow teachers to develop functional ideas without having to wade through all of the complex language. Through play and exploration, students can summarize their observations, and begin to characterize the relationships. As students begin to understand the relationships between variables, we then can discuss the need to have special notation to express them. Finally, dilations and reflections, which are often over-looked in our curriculum, become the stars of the show through fun (and addicting) Sketchpad games. My screen grabs here certainly don’t do Scott’s files justice, so download them, play around, and enjoy the dances! The math twitter-verse was abuzz this week with discussion of Riley Eynon-Lynch’s Activeprompt, a simple interface for student collaboration. 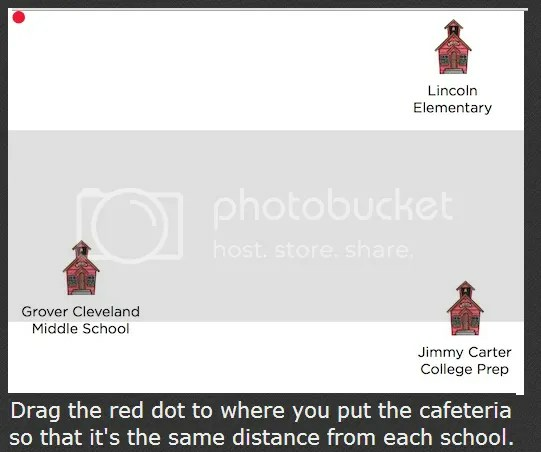 For me, my interest started with a tweet from Dan Meyer, which invited volunteers to click a link and drag a mysterious red dot to a point equidistant from three schools. The blank canvas is ready for us to fill. For me, I look forward to using this as a tool for student estimation, or having students contribute points to scatterplots. One of my favorites so far comes from a teacher who challenged students to work together to form two parallel lines. The surface has just barely been scratched here. Activeprompt is reported to also work on iPads, though I have not tried this yet. Looking forward to more attempts with this intriguing tool. This weekend, I had my first chance to toy around with the SMART Notebook app for the iPad ($6.99). My colleagues and I have a a nice bank of Notebook files we use, particularly in geometry courses, and I am most interested in utilizing the portability of the iPad to allows students to interact with math lessons. IMPORTING FILES: One of the issues I have with my iPad is how difficult it can be to work with files. But using DropBox along with the Notebook app worked quite well. I saved a few files I use from my desktop computer into DropBox. Choosing one of these files in DropBox on my iPad, they were recognized, and I was given the option of opening them in Notebook. Clean and seamless. The instructions file included with the app also gives you guidance on how to save and open files directly from the SMART Exchange. WHAT TOOLS DO WE HAVE? Once a file is opened, you have a “lite” version of the SMART Notebook software. Available tools are pen, eraser, text tool,and photo import. Some of the more popular and creativity-inducing features, like screen shade and the magic pen, are not available. No drawing tools either. Essentially, it seems easier to prepare a document on your desktop, then move them to the iPad. Like any iPad app, Flash animations will not run, which is a bit of a downer here. 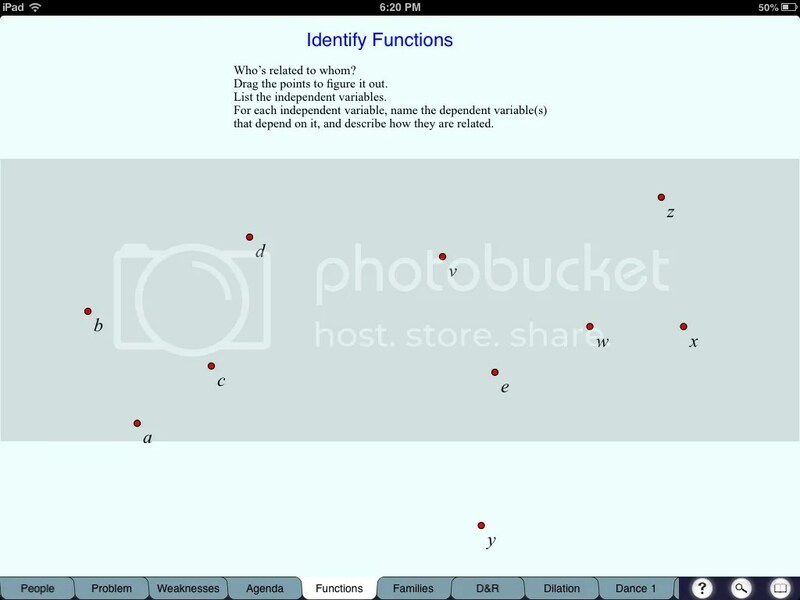 If I am thinking about ways I would like students to interact using the iPad,the manipulatives like category sort, vortex, and pairs would be most useful. But we can still make good use of drags and movement. WRITING NOTES: If you are like me, then writing on the iPad is a new experience. For small groups, my fat fingers may be fine to communicate ideas. But the idea of the infinite page we have come to know from Notebook does not seem to be a feature here. In the end, this app is really SMART Notebook “lite”, with the ability to look at files you have already created, edit and share them. I see this as a nice formative assessment tool for classroom. Imagine a Notebook file with a number of practice problems or challenges, and passing the iPad around to have students contribute their ideas. Connecting to a projector, a class discussion of student work could then be held, as students appraise each other’s work. I’m excited to try this with a class and observe their response to this tool.